Unique decor begins with unique design. 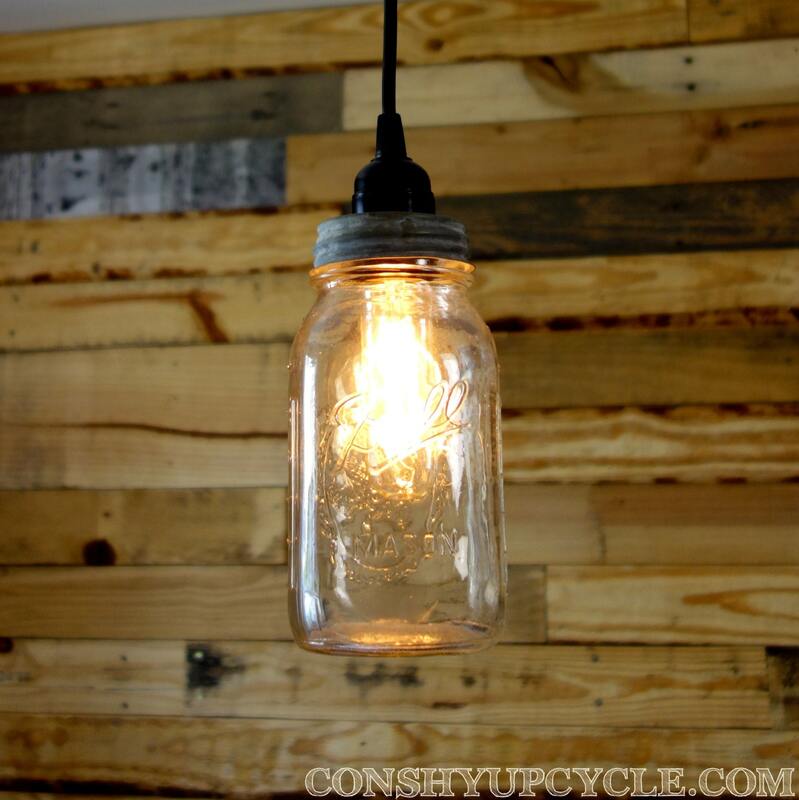 Introducing… the Clear 1 Quart Ball Mason jar hanging pendant lamp by Conshy Upcycle. Conshy Upcycle celebrates your unique decorating desires, bringing together Mason jars with new fixtures and certified electrical work to create distinctive lighting pieces for your home or business. Featuring US electrical parts this hardwired pendant lamp will add a unique style to your indoor setting. The Clear 1 Quart Ball Mason jar hanging pendant lamp measures 7" tall and 4" round. The pendant light hangs approx. 8' from the ceiling and can be easily shortened to your desired length. A Nickle plated canopy with mounting screws is included. Conshy Upcycle lighting is designed, handcrafted and tested in Pennsylvania and is available exclusively on Etsy. All Conshy Upcycle fixtures use standard bulbs from the US - the Clear Ball Mason jar hanging pendant lamp uses a medium base bulb and is designed to be hardwired. All lamps are built for indoor use, though installation in covered areas should be fine. Bulbs and mounting are not included, installation by a qualified electrician is always recommended. Conshy Upcycle lamps are made from vintage lamp shades and jars produced in the past 100 years - beautiful, reclaimed pieces from factories, barns and workshops throughout Pennsylvania, New Jersey and New York that all have their own story. Igniting light in industrial charm Conshy Upcycle breathes new life into vintage lamp shades, and mason jars, handcrafting unique lighting fixtures for homes, restaurants and bars across the US and Canada. All pieces are designed, built and tested by Phil Gatkiewicz in Pennsylvania.